Lovely restaurant with a nice atmosphere. Food was excellent. The waiter was wonderful and took time to describe the preparation of all their dishes. We were a group of eight and the service wonderful. I would definitely return to this little gem. Little choice and the main course was not very hot. The Scottish egg starter was nice but the steak main course was poor and the potatoes were over done to the extent of being burnt. A wonderful and memorable lunch with 6 friends for a birthday. We all had the 3 course lunch which was extremely reasonable and everyone enjoyed their food. Service was charming, friendly and efficient. 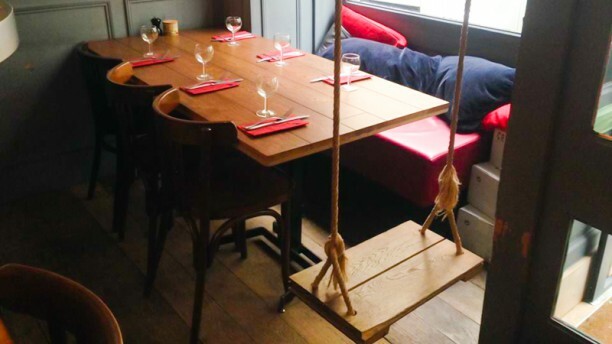 The restaurant is comfortable and quirky in a good way. Thank you so much for a very happy experience. Welcoming and attentive , with excellent advice from waiter who spoke in fluent English. Food faultless with excellent presentation. Definitely to be tried. Les n Liz . First to arrive tonight, was a bit concerned my 13 year old wouldnt eat anything from the menu, after the waiter explained what was on offer but managed to change the fish dish into something he liked and he was very happy. Surprised to have a Nintendo games player set up by the table, added bonus, little dark and romantic setting , ideal for valentines although my husband couldn't travel with us due to work. Food was lovely, small choice but the 3 of us give thumbs up to this little gem, good service, thank you! Food was excellent and the service great . Fun place. Food a bit disappointing, given the amazing reviews it had. Steak was cold. Crime brûlée inedible. Nevertheless we enjoyed our evening. Absolutely Wonderful food and the owner/ manager went above and beyond to make us feel comfortable and special.